← Goodbye, New Orleans. Atlanta for the night. Dallas and I did not get as far as we were anticipating the first day, but we did take care of a lot of business that needed to get done. We woke up around 9am and got ready to leave Emmaline’s house. After saying goodbye and thank you, we rode just a mile or so to get breakfast at J Christopher. From there, we rode to the Chase bank where we could get papers notarized – part of the process in obtaining our pedicab licenses for Newport. The bank was near a grocery store, so we got food afterwards, in addition to some money orders we needed to send for our pedicab licenses. We tried to mail our papers to Rhode Island from the shipping store that was in the same plaza, but they were closed until 2:30 for a mandatory weekly prayer. We ended up passing a post office not far from the plaza, so we stopped there to mail away our pedicab license applications and get passport photos taken (also required for the pedicab licenses). The whole process took forever, since we were kept waiting at the bank, the supermarket and the post office. I guess Friday afternoon is a popular time for getting errands done. 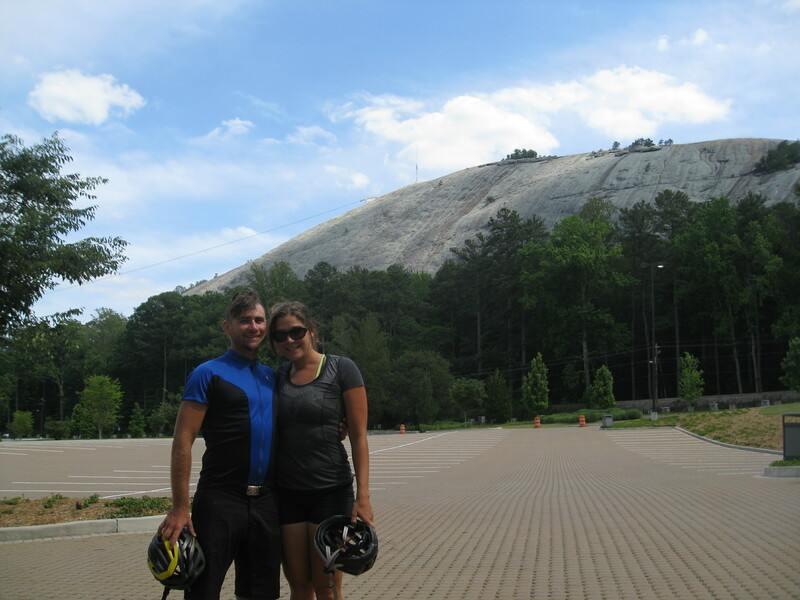 From the post office, we rode a short distance to Stone Mountain, where we ate our food at a picnic table. We rode the 5 mile loop around Stone Mountain and emerged along a bike path that ended on Main Street. There was a bike shop right at that corner, and Dallas was in desperate need of new brake pads. We waited at the bike shop for quite a while since the owner was out running his own errands. Leaving the bike shop with new brake pads, a new chain, and a new water bottle cage (all of which Dallas has yet to install on his bicycle), we continued south another 10 miles or so before we had to stop again. Dallas had gotten something in his eye, and it was bothering him enough that he couldn’t keep riding. We stopped at a Jamaican restaurant to use the bathroom and hopefully get the foreign object out of Dallas’s eye. Dallas went inside while I locked up our bikes. As soon as I entered, the waitress began questioning me about what I wanted to eat. I didn’t have time to think or look around or anything. Did I want chicken or fish or pork and how did I want it cooked? It’s fish Friday, so I can have the red snapper fried or curried or steamed… Umm…I just wanted to wait for Dallas and see what he wanted to do, but he was in the bathroom. I told her I needed to use the bathroom first, so I went in to wash my hands. When I came out, Dallas was still trying to fix his eye, and this time both the waitress and the bartender were pressuring me to order something. I really was more thirsty than anything, but they didn’t have smoothies like their sign outside had advertised and I didn’t think I wanted a beer or rum punch. I said that I would like to look at a menu and think for a few minutes first, but the bartender answered that she could give me a menu but it wouldn’t mean anything to me. It’s not like it wasn’t in English. Dallas finally came back and said I could order whatever while he went next door to buy eye drops at the gas station. I went with the curried fish. The entire red snapper (eyes and fins and everything) came out on a large plate with rice and beans and vegetables. It was actually delicious, and we contemplated ordering more food after we finished the plate. Dallas finally succeeded in dislodging whatever was stuck in his eye, and we rode around the corner to a mall plaza where we ate ice-cream. We hadn’t gotten very far, but it was getting late and would be dark in just a few hours. We decided to head slightly out of the way to get to a nature reserve where we would hopefully find a safe spot to camp. 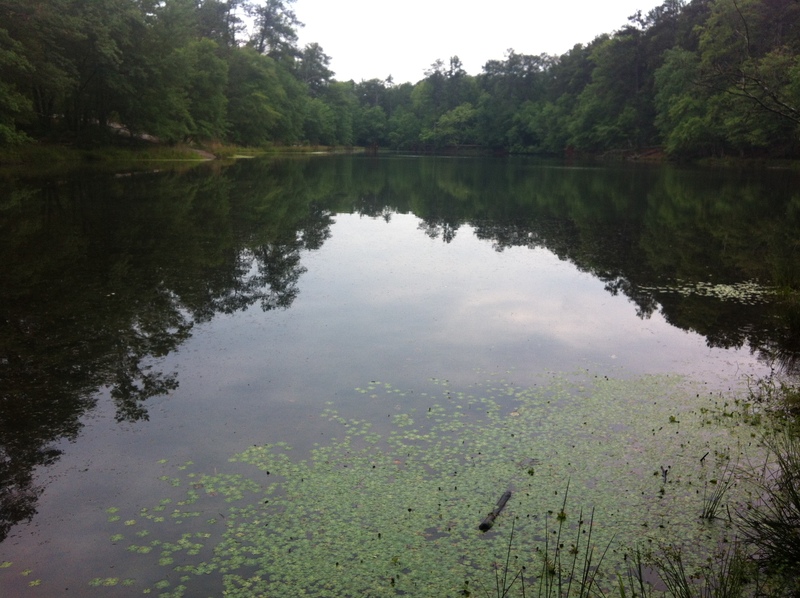 Arabia Mountain was beautiful, and we were able to find a wooded trail off the bike path that took us towards a lake. The area was deserted, so we camped out undisturbed all night and well into the morning. We were both so exhausted from the day that we passed out shortly after setting up the tent and did not wake up until after 10am! It was raining when we woke up, so we took our time getting dressed and packing our things up before taking down the tent. People in Georgia are so nice! So many people stopped us on our first day of riding, all wanting to know where we were coming from and where we were going. Everyone who talked to us had questions for us. A couple who saw our bikes outside tracked us down in the grocery store and asked about our trip. Another couple outside of the mall stopped their car to take photos with us and ask us the same questions. We really should get cards or stickers with a web link to pass to people and answer the FAQs. Maybe a youtube video explaining what we’re doing will be helpful, especially when we start traveling abroad and want to explain ourselves to potential couchsurfing hosts. 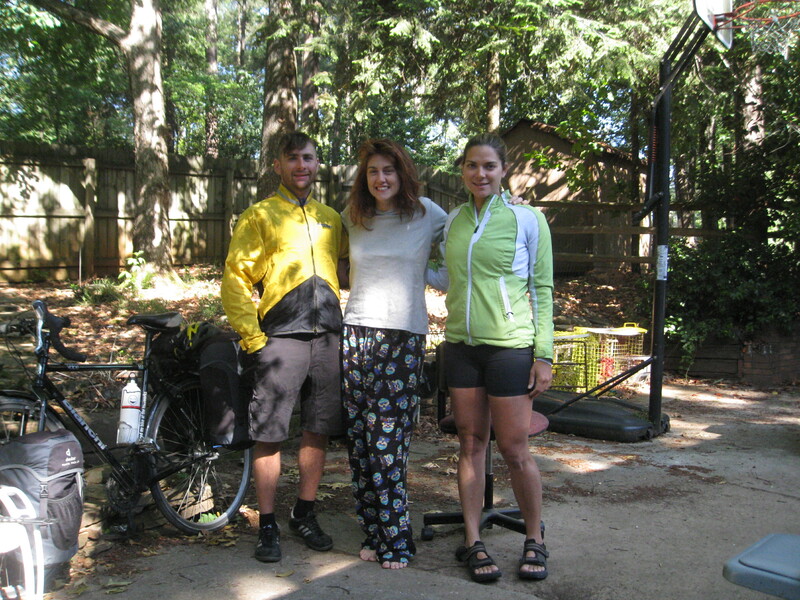 Posted on 12 May 2012, in Bicycle Touring, New Orleans to Newport. Bookmark the permalink. Leave a comment.